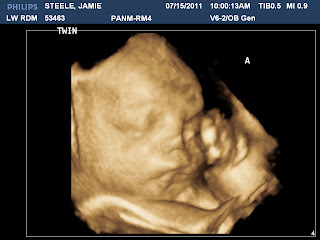 On Tuesday Jamie's uterus measured in size to that of a singleton pregnancy at 43 weeks. As you can imagine Jamie is very uncomfortable. Her OB/GYN has indicated that if she does not enter labor before 38 weeks she will schedule a cesarean section. Between the heat and her discomfort she is not relishing the thought of being pregnant for another six weeks. 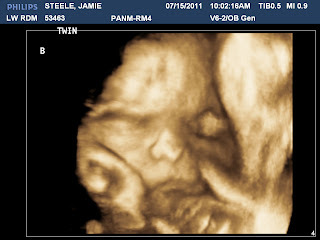 But the good news is on Thursday, July 14, Jamie crossed the milestone of being 32 weeks pregnant. Singletons and twins are much more viable after thirty-two weeks. Meaning if the twins were born today they would probably spend a month in the intensive care unit, but statistically speaking would be okay. Reaching this point is a huge deal for a multiple pregnancy as premature labor and birth is very common for multiples. It is a lot of tests, but thus far both Jamie and the twins have been hitting all of the right numbers. Currently Baby A is 4lbs 3oz and Baby B is 3lbs 15oz. Both babies are 16.7 inches long. One of the great things about having tests so frequently is we have seen our babies almost weekly for most of the pregnancy. 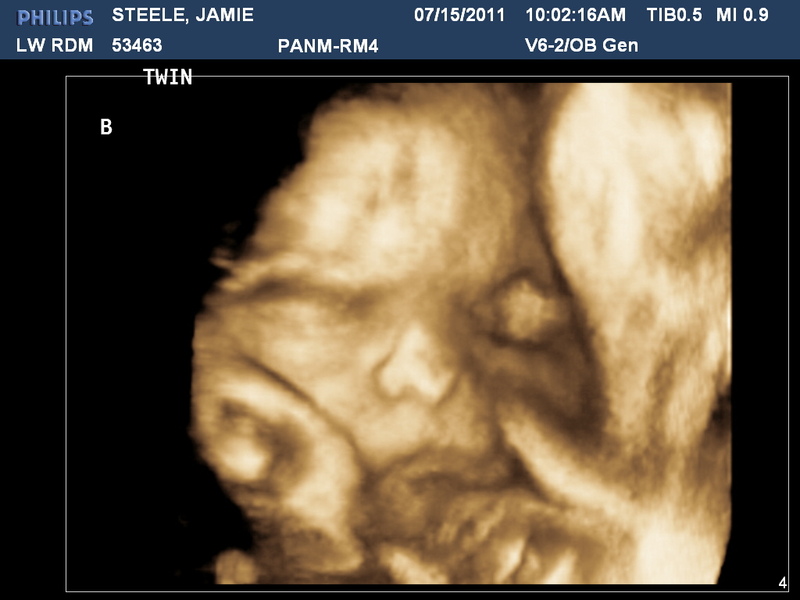 We have not uploaded a lot of the ultrasound photos as they have become overwhelming even for us, but wanted to upload the most recent 3D Ultrasound images of their faces. Avery and Molly were so excited to see pics of their newest best friends!